This issue of MRI Clinics of North America focuses on Advanced Musculoskeletal MR Imaging, and is edited by Drs. Roberto Domingues and Flávia Martins Costa. 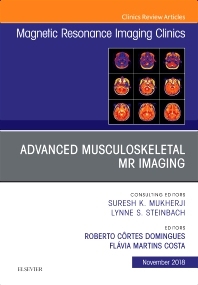 Articles will include: Quantitative Whole Body MRI; Multiparametric Bone Marrow Imaging; MET-RADS-P in Practice; Whole Body MRI Beyond Oncology; Whole Body Imaging in Multiple Myeloma; MRI Neurography in Musculoskeletal Disorders; MR Imaging in Rheumatology; Multiparametric MRI of Soft Tissue Tumors and Pseudotumors; Multiparametric MRI of Benign and Malignant Bone Tumors; MR Imaging of Fetal Musculoskeletal Disorders; MRI at Rio 2016 Olympic and Paralympic Games: Our Experience using State-of-the-art 3.0 T and 1.5 T Wide-bore MRI Scanners in High Performance Athletes; Ultrasound and Advanced MRI Fusion for Musculoskeletal Tumors Biopsy; and more!